Porsche makes beautiful cars. I for one hadn't really noticed it till about a few years ago. They've changed very little about their basic design through the many years of legendary models, which is unique for car designs.And then they made the mistake of venturing into other segments - SUVs and Sport Sedans. I've always felt that the Cayenne looks like it aint really there yet, and the Panamera is just downright ugly. Pretty sure they're both successful in terms of sales - seen loads of them here too. Wish they had stuck to what they do best though - make awesome sports-cars. 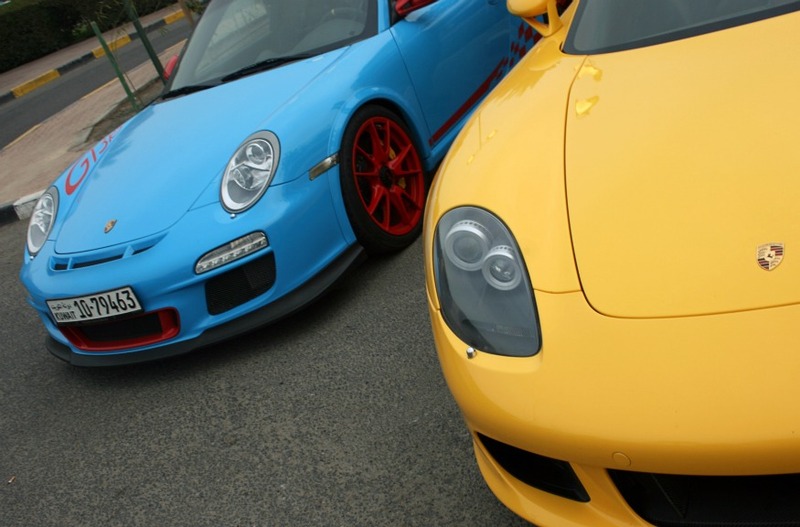 The 911 GT3 RS (in Riviera Blue) and the Carrera GT at Marina Crescent's parking lot.